Daily Illuminator: Expand Your Vehicular Possibilities! May 13, 2013: Expand Your Vehicular Possibilities! Supercavitating submarines! Magnetic sails! Stargates! Windmills! . . . Windmills? Sure, why not! Windmills are cool! All these and more are additional vehicular options presented in GURPS Classic: Vehicles Expansion 1, newly released to e23. This supplement adds to the possibilities of GURPS Vehicles, the ultimate sourcebook for GURPS Third Edition craft construction. 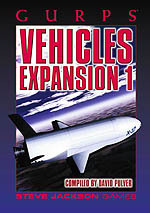 Written by noted mechanical mastermind David L. Pulver, GURPS Classic: Vehicles Expansion 1 augments your garage with even more awesome choices -- even windmills!